We would like to create a paperless and sustainable workflow that allows builders to access metadata needed on the building site during the construction process and we want this workflow available in real time. In this way we can display the evolution of the information. That it is why we call HOX, from the homeobox hox gene that carries the main data and transfers them from parents to children. This is a framework that can enable multiple workflow in the industry. This hack enables realtime workflow for a WebAR and WebVR experience. In this way it is possible to access all the metadata from a BIM model (whatever format it is: .obj .fbx .ifc .bxf .jsone) and transfer to SVF file through the FORGE Autodesk Platform. In this way, all the workflow through 3DMax, Unity, all the remodelling of materials, the textures will happen automatically in real-time. The most important part is that we have created a remote control for the user's experience. So the builder on site can be guided as to what he needs to do and he can access all the required information. This also allows for multi-users meetings around the same virtual model in a virtual environment that can be for VR or AR. In this special occasion, we focused on the Mira Headset for its ability in offering a cheap solution in the market. We used a Revit file and built the application with Visual Studio Code and Unity 2017.01.3. We used GitHub for the version control and to collaborate in a more efficient way. We deployed the app in Heroku and we also used the WebSocket format in order to transfer the real time state. 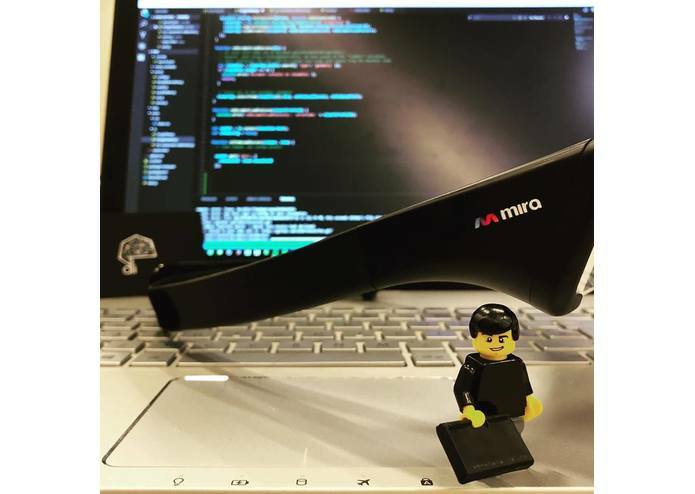 We build also for Mira Headset for their democratic and open approach in the technology. The most challenging part is storing the Id and the Camera quaternion from the Forge Session in an external database and passing this to Unity. In Forge the model is loaded on the fly inside an empty game object and every single operation should is scripted at runtime. We were able to create a fully working app for the WebAR and WebVR component and enabled metadata disp[lay in AR. This is a real breakthrough in the AEC industry. The team was really well organized and even though we lacked a professional developer on the team we were able to achieve great results thanks to the support of the main software and hardware developers. A big thank you to the Forge Team, Mira, Unity and the Creating Reality Hackathon Mentors (Dan Miller, Augusto Goncalves, Leonard Daly, Kat Harris, Christine Barron). We are going to present our work at two conferences: BILT NA 2018 and BILT EUROPE 2018. This will be also part of two USC University thesis' from our students. The students would also like to open their startup in few years using this as a starting point. I have done the Web Development component with Forge thanks to the support of the Forge Developers. I also gave the main guidelines to the workflow that need to be applied. I work as Research and Development at HOK. Strong passion in deeplearning and webAR. I worked with Unity 3D integrating Autodesk Forge technology into the Mira prism for interactive web remote controlled architectural visualization. I started to optimize the Forge integration through parsing the Json camera forge coordinates with a real time camera path in Unity. In this way the client can be driven by the designer/developer into an immersive AR experience. Everything web based. Also, in further development becomes interesting how the physical context of the user could partially match the augmented space, generating new discussion about the project development. Virtual and actual information are coexisting for an interactive process design between the designer and the client. Alessio Grancini is an XR designer based in the city of Los Angeles. His operates between architecture and extended reality media. Experienced in AR/VR multi-user development for collective spatial experience. This is the preview video of the project.